Because of their expertise, professionalism, and willingness to work with us under extremely tense conditions, our building was finished early. It is clearly the jewel of our community. Whether it’s a small renovation or a brand new building, Rudolph Libbe Group has long-term experience in construction and maintenance of educational facilities from a single elementary school to multiple facilities on a university campus. A key responsibility for educational boards and districts is protecting the community’s investment. That’s why construction budgets are met and managed by an RLG team trained to minimize ongoing operational costs. One way we do this is by focusing on energy savings, which can be significant. RLG LEED-certified team members help build in efficiency from the beginning of a new project — or bring energy management solutions to an existing facility — with services ranging from mechanical, electrical, and HVAC upgrades to small construction projects, facility management, and utility procurement. RLG builds and supports great learning environments, keeping students and staff comfortable and productive. RLG has expansive experience delivering successful projects spanning a variety of industries. Does CHP Have a Place in Your Resilience Strategy? 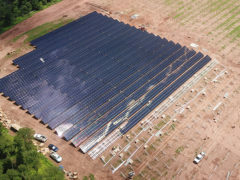 If you’re considering solar power for your facility, these 9 questions should be asked to any potential solar provider.